I am going to spoil the end of this review by mentioning, from the first line, that this is a 5 stars book. Also, I do what to mention that I am very much in love with Greek mythology and especially with this particular story, with Troy and all it represented. My first real book was one describing Troy and its destiny. I was too little to understand even the meaning of some of the words. Only after finishing the story, I started reading more about the Greek mythology and I loved it so so much. I fell in love with reading with these stories. 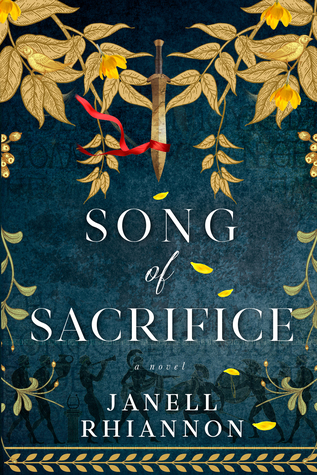 Now, back to “Song of Sacrifice”. This book was absolutely amazing. It’s a tribute to this land of gods. It does so much justice to the legends and it brings out the most beautiful elements in it. I have devoured it and could not stop reading. Actually, I don’t understand why it had to end. I know the legend, I would never have imagined it put in a book in this way. And it twists the myth in all angles so that we have an even better picture of how it all went out. It’s like being there. Honestly, it’s like finding out more things about the characters I’ve grown up with. But my connection with the story is not only due to my childhood experience. Janell Rhiannon has such a captivating way of using words. It’s like a spell, she put a spell on me. And the cover fits so well. Everything fits here. The poem in the beginning (yes, it has a poem, I’m sorry I’m spoiling a little) it’s like a gateway to this amazing world. Then all the strong women, mothers, queens, goddesses… oh, how many interesting elements. I liked it, ok.
Thabk you and thank you for the opportunity again! It’s … just great !